"Something I Need" is track #8 on the album Native. It was written by Tedder, Ryan / Levin, Benjamin. 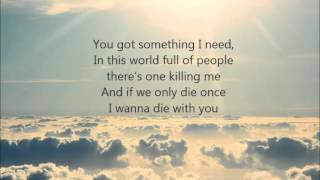 OneRepublic's Something I Need lyrics-OneRepublic music video in high definition. Learn the full song lyrics at MetroLyrics. Watch the Something I Need video below in all its glory and check out the lyrics section if you like to learn the words or just want to sing along. What does OneRepublic's song Something I Need mean? We have the answer.